On this bike ride, in northwest D.C.’s DuPont Circle neighborhood, as I was riding near the intersection of M Street and New Hampshire Avenue (MAP), I saw a sight that no one, especially a cyclist, ever wants to see – a ghost bike. A ghost bike is a bicycle that is painted white and left as a memorial at a site where a cyclist was fatally injured by a collision with a motor vehicle. This particular ghost bike was put there in memory of Jeffrey Hammond Long, a 36 year-old D.C. resident who was struck and killed at about 2:15 p.m. on Saturday, July 7th, just ten days ago. Jeffery was riding in a designated bike lane when a large truck, which was travelling in the same direction as Jeffrey, turned into the bike lane as it attempted to make a right turn onto New Hampshire Avenue. The truck crashed into Long, causing him to fall beneath the truck. Medics took Jeffrey to a hospital, but he was pronounced dead the next day. Many cyclists, and even pedestrians, who are familiar with the intersection say it’s known to be unsafe. And I agree. I have been through the area and that particular intersection numerous times. And although I have never been involved in an accident, I have seen vehicles parked in the bike lane, or even traveling in the wrong direction on M Street. So later, after my ride, I looked into it and discovered that at least seven other crashes have occurred at the intersection involving cyclists in the past three and a half years. And a collision two years ago resulted in the death of a pedestrian crossing the street. And a few days ago the District Department of Transportation agreed that the intersection is unnecessarily dangerous, and removed four parking spaces on M Street near the intersection to allow for better visibility for drivers making a right turn across the road’s bike lane. DDOT also announced that the sidewalk will be widened in the near future. It’s sad that DDOT did not make the changes prior to the devastating accident that took Jeffrey’s life. It was an accident that was preventable. But hopefully they will learn from this and proactively work to make other known dangerous areas safer before another cyclist dies. The D.C. Department of Transportation said on Twitter that it is working with the Golden Triangle Business Improvement District and other city agencies to expand the sidewalk along M Street. The agency said plans are to realign the M Street bike lane adjacent to Duke Ellington Park, but more details will be provided by the business group later this month. 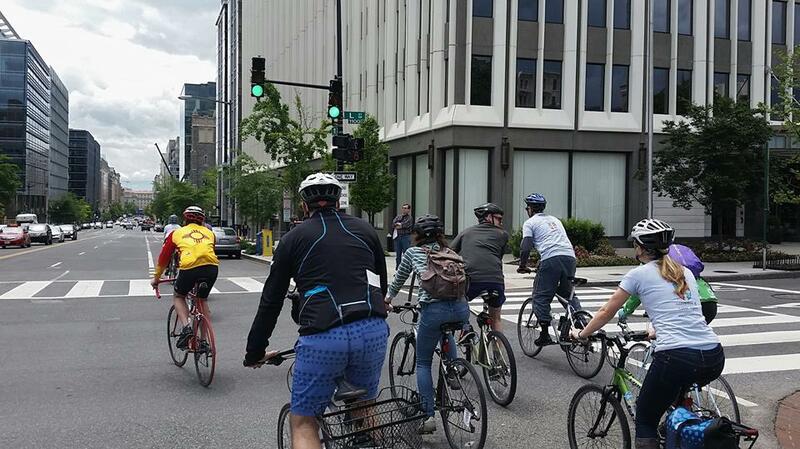 UPDATE (07/19/2018): In response to the death of Jeffrey and other recent preventable deaths in D.C., the Washington Area Bicyclist Association (WABA) hosted the “Rally For Streets That Don’t Kill People” in front of the John A. Wilson Building on Pennsylvania Avenue today. I attended the rally, along with between 150 and 200 cyclists and concerned citizens. Three years ago, Mayor Bowser committed to eliminating traffic fatalities in D.C. by 2024. But since then the numbers have only gone up. Since then, more than a hundred people have died on the city’s streets. The rally was intended to demand swift action to stop the deaths on our roads, and to communicate that every single one of those deaths could have been prevented and the city just isn’t doing enough. I don’t often write about my weekend bike rides, but this ride was different. And definitely worth writing about. My favorite youngest daughter was supposed to have a softball double-header this morning, but the condition of the fields remained so wet from all the rain during the past week that the games were cancelled. 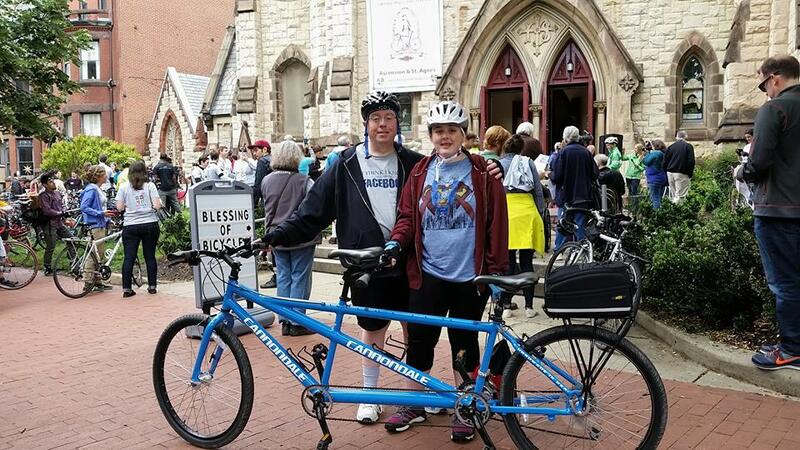 So instead, she and I grabbed one of our tandem bikes and went to D.C.’s first annual Blessing of Bicycles service at The Church of the Ascension and St. Agnes, located at the bike-friendly intersection of Massachusetts Avenue and 12th Street (MAP) in downtown D.C. 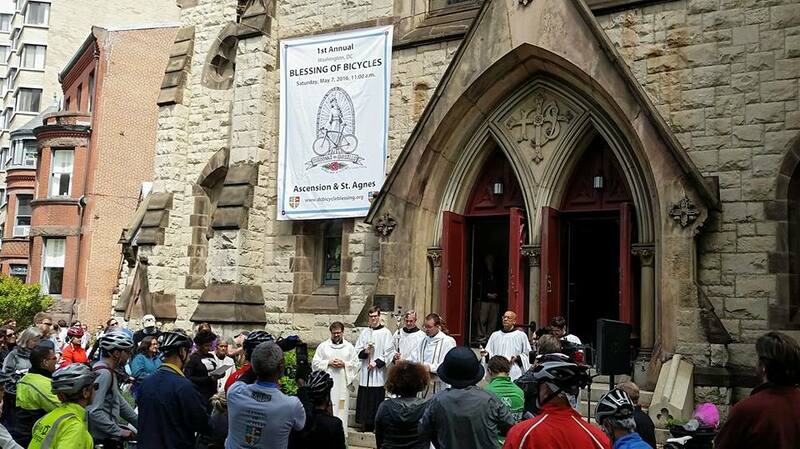 Led by Father Dominique Peridans, the Blessing of Bicycles was a short, non-denominational outdoor prayer service asking God to bless the bicycles and provide both protection and joy for cyclists as they ride. The service also included a time of remembrance for cyclists killed on local roads during the past year. Blessings are a way that the Anglican church shows love and support for various groups, regardless of your stance on faith. 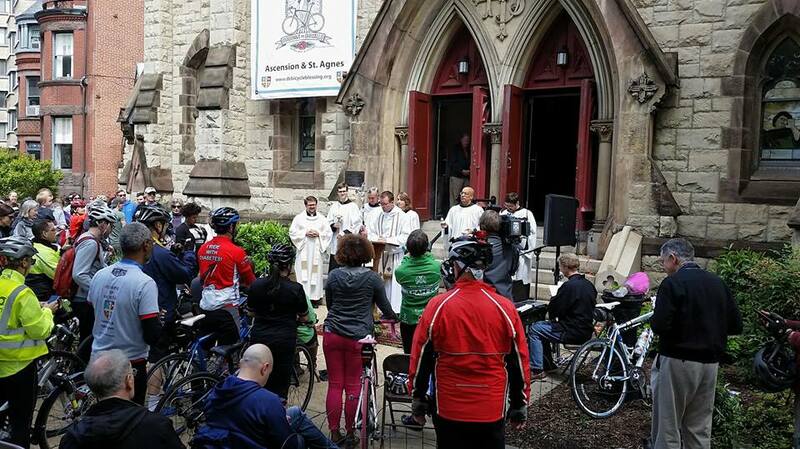 So the service was inclusive and open to all – regardless of religious affiliation or any affiliation at all, fat or thin tires, and brand of bike. 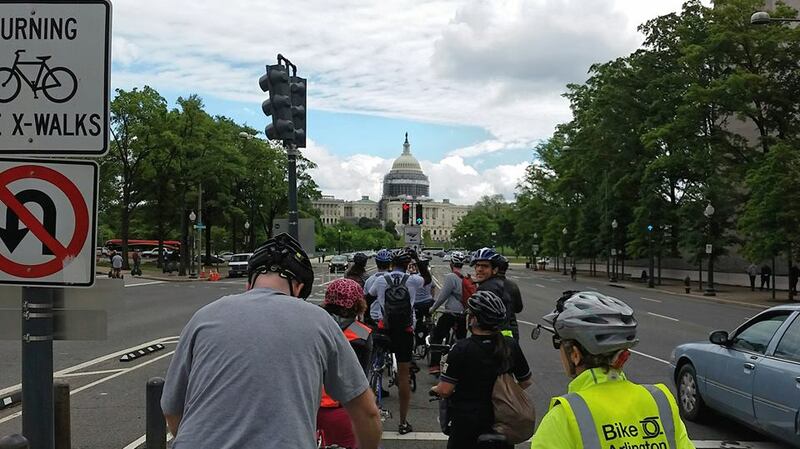 Attendees were also addressed by community representatives from the Washington Area Bicyclist Association and the District Department of Transportation. 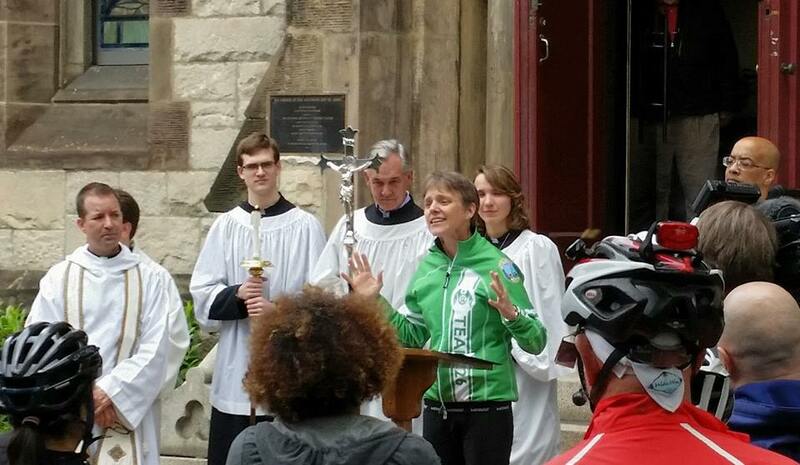 MariAnn Budde, the Bishop of the Anglican Communion of Washington and an avid cyclist, also spoke and provided a prayer for the cyclists and their bikes. 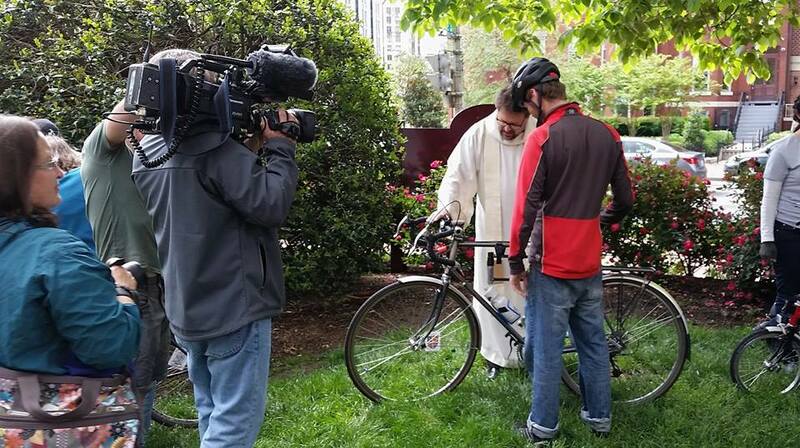 The service was followed by optional individual bicycle blessings for people who wanted a personal benediction. There was then a short time for mingling during which everyone was be able to purchase pizza, baked goods and other snacks, drinks, and event T-shirts with an image of Madonna de Ghisallo who’s been dubbed “patron saint of cyclists,” designed by Cycology Gear. All proceeds are to be used to help make the church’s 142 year-old church building more accessible for the disabled. Free bicycle tune-ups were also offered by Gearin’ Up Bicycles, and free bicycle accessories and bike-related prizes were provided by Capital Bikeshare and the District Department of Transportation. We then went on a sponsored group “unity ride” through the city led by Bishop Budde. The ride had two options, both short and longer, allowing for participation by all, regardless of experience or skill level. So what started out to be a day of cancelled plans turned into the chance to participate in one of the most unique and enjoyable cycling events in the city, and one of the best days I’ve had in a long time.